As time goes on, we are learning more about the wonderful photos that we have of the Tiger Creek Mill. First of all, a couple of Amador County photos that aren’t of the Tiger Creek operation. Interesting photo, probably not at Tiger Creek, but we’d like to know more about it. Which mills used horse drawn trains? Click on the photo for a clearer image and better text. 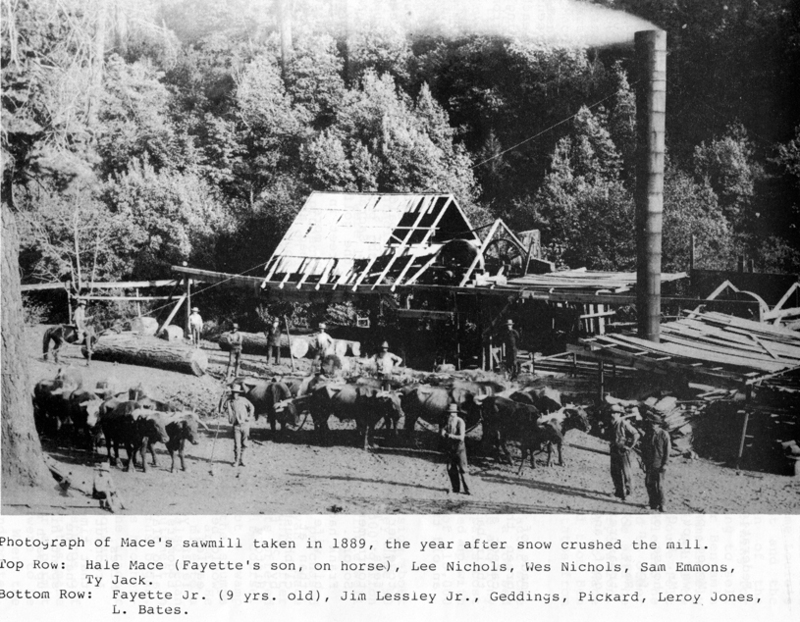 We know that a number of photos were taken of the Tiger Creek Mill about 1910. That would seem to be about the time that these photos were taken, based on the machinery shown. The Tiger Creek Mill was a P.G.&E. 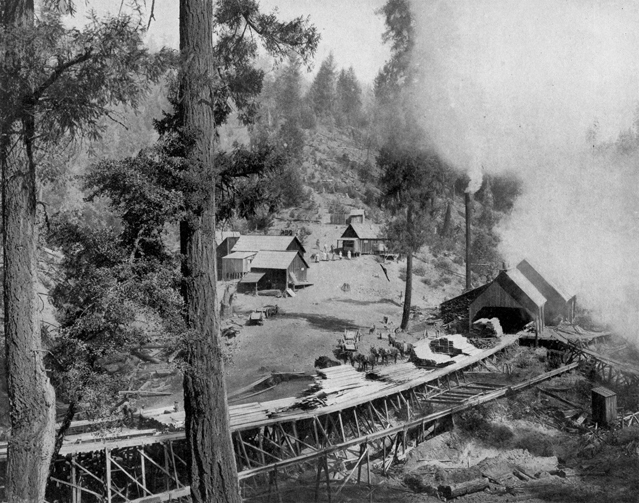 operation producing lumber for their flumes and other construction. We’ll start with some new-to-us photographs of the Tiger Creek operation. These photos are courtesy of the Amador County Historical Society and the Amador County Archives. Here are their captions for the photographs above. Rather than re-typing and losing the originality and character of the book from which the text is taken, the editor has decided to put the text here in its original form. Clicking anywhere on the text will take you to a full page view. Lumber movement out of the mill on this tramway on its way to the canals. Here are some more photos of the Tiger Creek operation that we acquired in the past. Interesting photo of Tiger Creek Mill. Lots of stuff going on in this photo. Flume at Tiger Creek. Power Generation? Log transport? what he thought he was seeing at the far end of the tracks. There is no deck built between the two cars at the end of the wood deck. A 400% enlargement shows that the dark area is the shadow cast by low angle sun from the viewers right shoulder. With the sun angle figured in, the shadow matches the irregular load on the right car. The “deck” is the railroad grade beyond the cars is the railroad grade that curves to the right. The picture is not “plumb” which cause the railroad grade to appear very steep. I believe that the pictures of the Lumber Yard and the Wooden Flume are on the Upper Standard Canal which flowed from the Tiger Creek Mill to the Petty Forebay at Lake Tabeau. 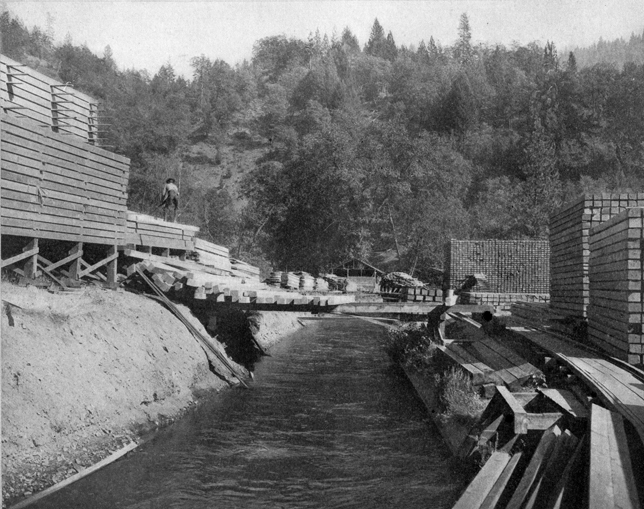 The water in the Upper Standard was diverted from the North Fork Mokelumne River by way of a diversion dam approx. 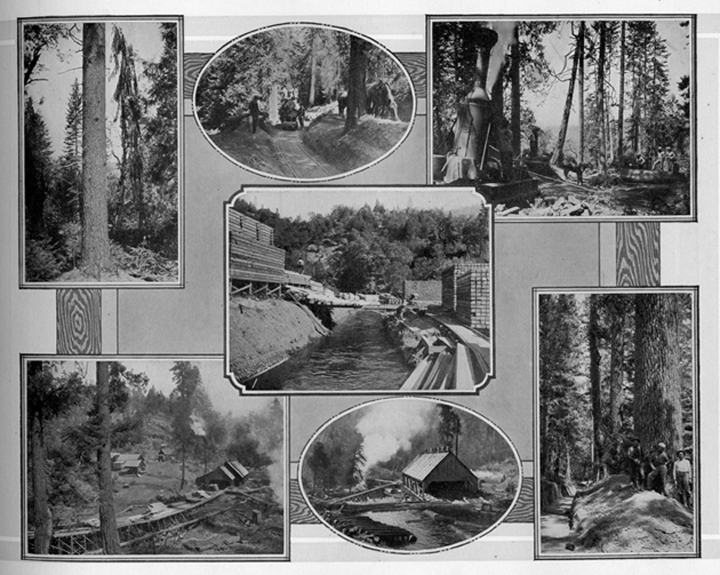 1/3 of a mile upstream of the confluance of Tiger Creek and the Mokelumne River and through a tunnel that terminated at the head of the canal. Both the diversion dam and the tunnel are still there. The Upper Standard was used to transport lumber but its primary function was to supply water for power generation from Old Electra Powerhouse. After leaving Petty Forebay the water went to a penstock that dropped it approx. 1200 ft. to the tubines in Old Electra which was on the Mokelumne River about 14 mi. downstream of the Tiger Creek Mill.